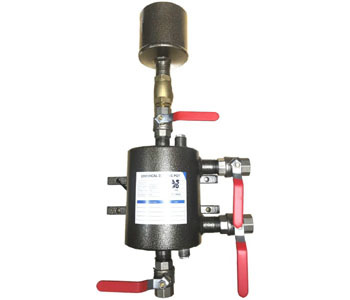 Air and dirt separators are used to continuously remove the debris and air contained in the hydraulic circuits of heating and cooling systems. They are capable of automatically removing all the air present in the system down to micro-bubble level, with very low head losses. 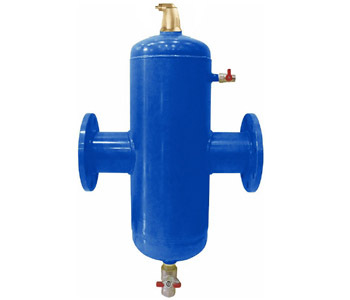 The large air collection chamber is able to accommodate a large volume of air before being released automatically. At the same time they separate debris and impurities contained in the system which collect in the lower part of the collection chamber from which they may be expelled via the blowdown valve. The circulation of fully de-aerated water enables equipment to operate under optimum conditions, free from any noise, corrosion, localised overheating or mechanical damage, important for reducing energy demands and running costs. Our Air and Dirt Separators and our Dosing Pots are of the highest quality and competitively priced, details are below. To see more info simply click on the items below. If you are unable to find the item you are looking for please contact us and we will strive to meet your requirements. Specials are available upon request.